It’s Halloween again: The Real Ghost of Nathan Hale | You're History! Nathan Hale is remembered today as the 21 year old volunteer spy who was hanged in New York by the British in 1776. I often used to wonder how someone facing imminent death could come up with such last words as, “I only regret that I have but one life to lose for my country.” After I joined the staff at the Hale Homestead Museum in Coventry, CT, where Nathan was born and grew up, I learned that, while a student at Yale, Hale studied ancient cultures and may have acted in the play “Cato”, by Joseph Addison, which is all about dying for one’s country. Nathan’s words were probably a quote or a paraphrase from that play, which would have been instantly recognized by any educated man, English or American. When Patrick Henry said “Give me liberty or give me death”, he was quoting from the same play. Nathan was buried in an unmarked grave in New York City, the exact site of which is unknown to this day. While there are numerous little anecdotes about Hale family ghosts, I’ve never heard any about Nathan himself. But there is a kind of ghost or shade of him that can be easily seen by anyone on the 2nd floor of his family’s home. This is the story. Nathan was not the only Hale son to die as a result of the War for Independence. Five of his 7 brothers also fought with the army, and his older brother Joseph, who was fortunate enough to return home and father 3 daughters, died several years later. Joseph had been a prisoner of war for a time, held captive in one of the infamous British prison ships anchored off New Jersey. Prisoners who survived often suffered lingering illnesses of various types, and it’s believed that Joseph brought consumption (tuberculosis) home, a disease that was notoriously contagious, and that killed him and, as the years passed, the greater part of the Hale family. After Joseph’s early death, his widow came to live with her husband’s family at Hale Homestead, staying with her 3 little girls until her remarriage. At that time, for reasons unknown, one of the daughters, Rebecca, remained behind in Coventry. 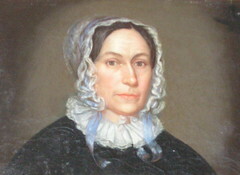 She grew up on the farm, leaving only at the time of her marriage around 1800. By the time she returned once more to Coventry, she was getting on in years. She left a letter telling an intriguing story from her childhood. Rebecca wrote that, on the back of her chamber door was a “shadow portrait” of her by-then famous Uncle Nathan. When she visited the house, now owned by strangers, she looked for the image, but, to her great disappointment, it had been painted over. Rebecca’s letter describes her disappointment and her belief that it was gone forever. Some 70 years later, the man who restored the house to its 18th century style was shown Rebecca’s letter. Immediately he started hunting for this mysterious image, and when he had the paint removed from the door, (Rebecca described its location), a silhouette etched into the wood in pencil came to light. 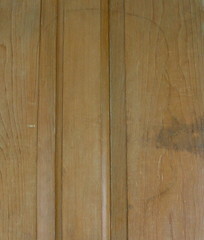 It seems strange to modern thinking that someone would draw on a door this way, but it actually seems to have been customary among English families. Thomas Hardy wrote a poem about a mother who took her son’s silhouette upon a wal, before he left for war. But is this really a likeness of Nathan Hale? Who knows – you can draw your own conclusion. But I’m pretty positive that it’s either his likeness or one of his brothers’. At any rate, every time I show the mystery man to visitors, I feel Nate’s presence, at least in spirit. This is fascinating! I’ve read about the custom of “profiling” in the 19th century. Seems it was a parlor amusement where subjects would sit before a lamp or light source and someone would then trace their silhouette on a paper tacked to the wall behind them. Probably not the way this likeness was created, but this reminded me of it. What’s the name of the Hardy poem? I’d love to read it. Also, as an old English teacher, I found the information about the source of the famous quotations of Hale and Henry so interesting. The study of literature used to have real consequences in shaping people’s lives. This is a wonderful blog and a great post! Really interesting – I’ve wondered about those perfect quotes, as well. Now we know. Or almost know. Doing some catching up here, hope you don’t mind. I do hope you’ll be coming back.